Toyohara Kunichika (1835-1900) Three Friends of Winter (Shochikubai kotoshi banashi) - Plum, 1869. Oban. Another very finely made actor portrait by the last of the great theatre artists, Kunichika. These early, 1860’s portraits are among the very best of his work. This print is from a short series of actor portraits… disguised prints - this one archly pretending not to be an actor print but celebrating the Three Friends of Winter… the shockikubai of the title. The Three Friends of Winter, also known as Suihan Sanyou (or shochikubai), symbolise the pine, bamboo, and plum. The Chinese observed that the pine, bamboo and plum do not wither as the cold days deepen into the winter season unlike many other plants. Known by them as the Three Friends of Winter, they entered the conventions of East Asian culture. Together they symbolise steadfastness, perseverance, and resilience. They are highly regarded in Confucianism and as such represent the scholar-gentleman's ideal. This print represents the plum tree, seen in the background whilst on the elaborate embroidered kimono is a representation of the legendary magician, Kan Shojo. Kan Shojo is the stage name given to an actual noble of the 9th century, Sugawara Michizane. Michizane was an adviser to the Emperor and known to be one of the most erudite, most learned of all men of his generation. Jealous courtiers, a change in the succession and politics of the the 9th century court changed his status and he was eventually disgraced and unfairly exiled. He died of a broken heart and it is there that the really great legends begin… he was said to have returned to wreak havoc on Kyoto and upon his enemies, in the form of a thunder god. He is often pictured as a deity, throwing lightning bolts. He even appears as a character in popular culture as seen on Yokai… . A complex print, a kind of late mitate… a print whose imagery stands in for something else. 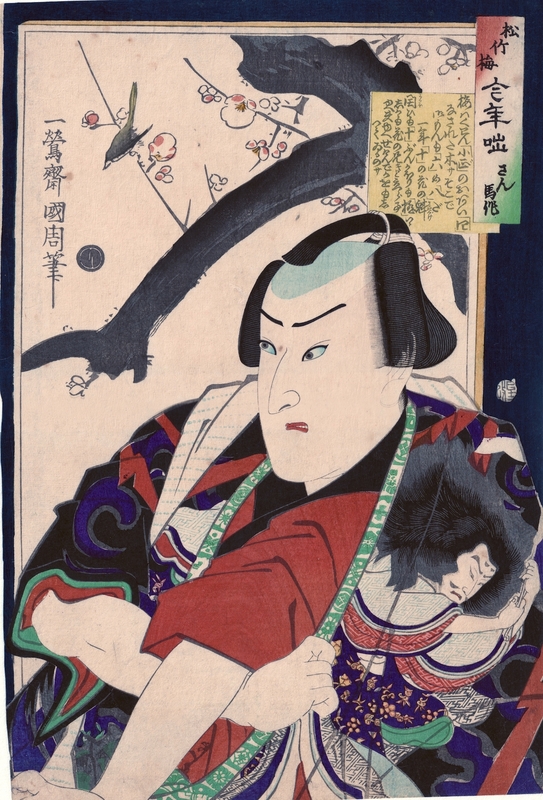 In this case, the actor is a vehicle for the expression of steadfastness, here emphasised by the plum and the allusion to the long suffering Kan Shojo on the kimono. A very beautifully considered print. Colour, condition and impression are all fine and there is extensive embossing to the entire print.